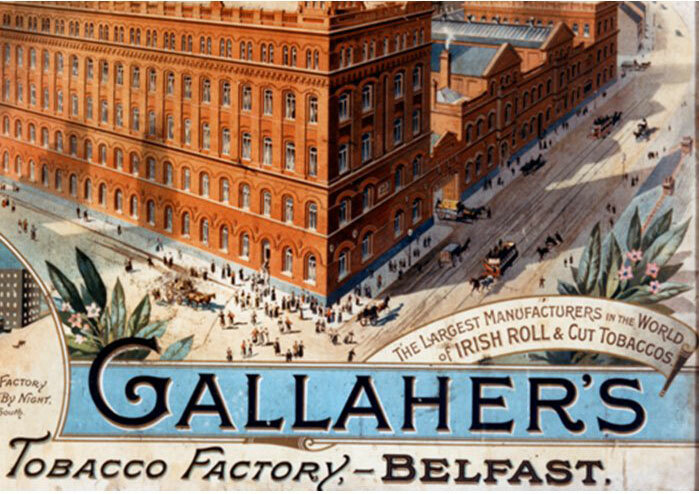 Gallaher Tobacco Company, now part of Japan Tobacco, was originally founded in Derry in 1857 by Tom Gallaher. By 1896, he had opened the largest tobacco factory in the world in Belfast. The premises was extended many times between initial completion in 1896 and 1939 by the same architectural firm – Samuel Stevenson Architects, later Samuel Stevenson & Sons. Many properties on York Street were badly damaged during the Belfast Blitz including York Street Mill and Gallaher’s main factory. This prompted the decision to build a brand new factory at a site purchased just outside Ballymena, built specifically for cigarette manufacture. These buildings have now been demolished.